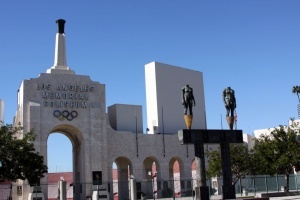 Home of the USC Trojans and Los Angeles Rams. The nearest Metro Rail stations are Expo Park/USC Station and Expo/Vermont Station, which are served by the Expo Line. From the Red Line or Purple Line line, transfer to the Expo line at 7th Street/Metro Center Station. From the Blue Line, transfer to the Expo line at Pico Station. For post-game service, riders toward Downtown LA should board at Expo/Vermont and riders toward Santa Monica should board at Expo Park/USC. The nearest station is Los Angeles Union Station. From Union Station, take Metro Rail Red Line or Purple Line to 7th Street/Metro Center station, and then transfer to Metro Rail Expo Line. Metrolink tickets include free connection on Metro Rail. This page was last edited on 24 August 2018, at 21:33.